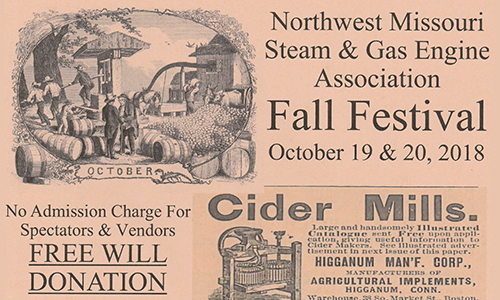 Join the Northwest Missouri Steam and Gas Engine Association in Hamilton on October 19 and 20 for a historical agriculture and homesteading exhibition. Northwest Missouri Steam and Gas Engine Association promotes the preservation of historical agricultural practices and homesteading skills in Missouri. Blacksmith, kettle cooking, cider mills, apple butter making, and many other traditional skills will be demonstrated. Bring your voice or an instrument and play along in an old time music jam. Steam and gas engines and draft horse power will exhibit plowing, threshing, sawmills, and corn grinding.